US: Rosa Parks refused to give up her seat on a bus, so it was fitting that her statue unveiled Wednesday by President Barack Obama in the US Capitol depicts her in the position from which she launched a civil rights revolution. Congressional leaders, dozens of relatives and several hundred guests joined Obama as Parks, represented by a nine-foot (2.7-meter) bronze statue, took her rightful place among the nation's heroes depicted in Statuary Hall. 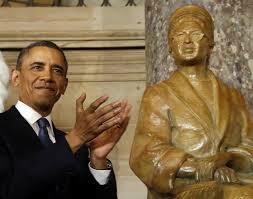 The statue is the first of an African-American woman in the US Capitol. “This morning we celebrate a seamstress slight in stature, but mighty in courage,” Obama said in tribute to the woman who, on December 1, 1955 at age 42, refused to give up her seat to a white passenger on a crowded bus in Montgomery, Alabama. “In a single moment with the simplest of gestures she helped change America and change the world,” the president said. James Clyburn, the most senior African-American in Congress, described Parks as “the first lady of civil rights, the mother of the movement, the saint of an endless struggle.” Blacks were freed from slavery 150 years ago when president Abraham Lincoln signed the Emancipation Proclamation, but it took another century marred by second-class citizenship, racial violence, and voter suppression before the civil rights movement took root, culminating with the Civil Rights Act of 1964. “As America shapes its future it struggles with its past -- a past in which equality was our principle but not always our practice,” said Democratic Senate majority leader Harry Reid as he noted the country's continuing efforts to “eradicate slavery's unsavory successors: racism and inequality.” “Without the determination and sacrifice of Rosa Parks, this presidency... and so much of the progress we have made to perfect our union would not have been possible. So today a nation pays enduring tribute to the woman who moved the world when she refused to move from her seat.” Parks is depicted in the statue as many Americans envision her: sitting, hands folded across her lap and clutching her handbag, her hair pulled back, and staring steadily out from behind rimless glasses. But she was no meek woman. She fought hard for her right to vote, fighting a voter literacy test skewed against African-Americans.